Colder days means no more opportunities to wear sandals or open shoes. Which is quite of a bummer. Therefore I've turned to (biker)boots to add that extra touch to my outfits. I advise to choose your boots in a different colour than you're used to. 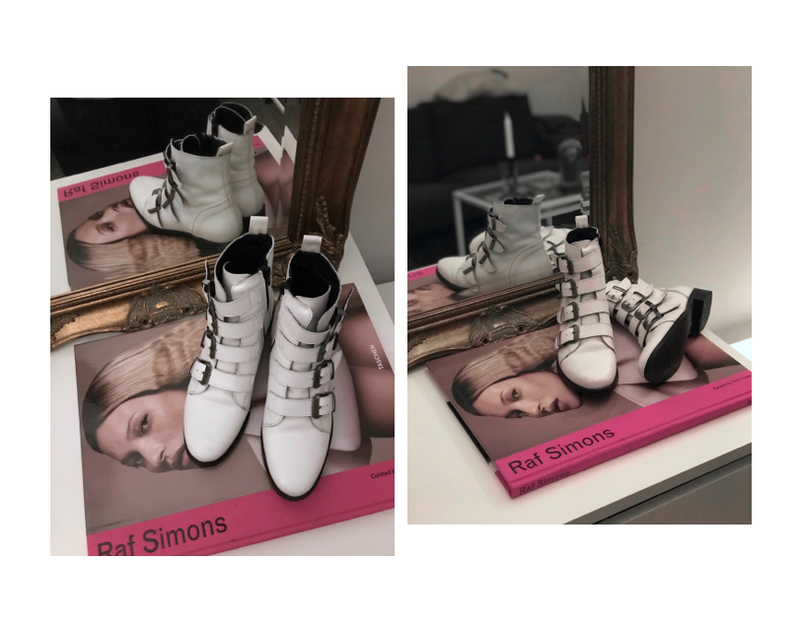 An all black outfit with white biker boots for example can be a true statement look. Not that I'm a professional stylist of course, I just love to add a surprising aspect to ensembles. And it's easy too. I found these white buckle boots while browsing for the new it-shoes of this winter. I'm definitely convinced that white shoes should be a standard wardrobe stable in everyone's closet. Daring but subtle. 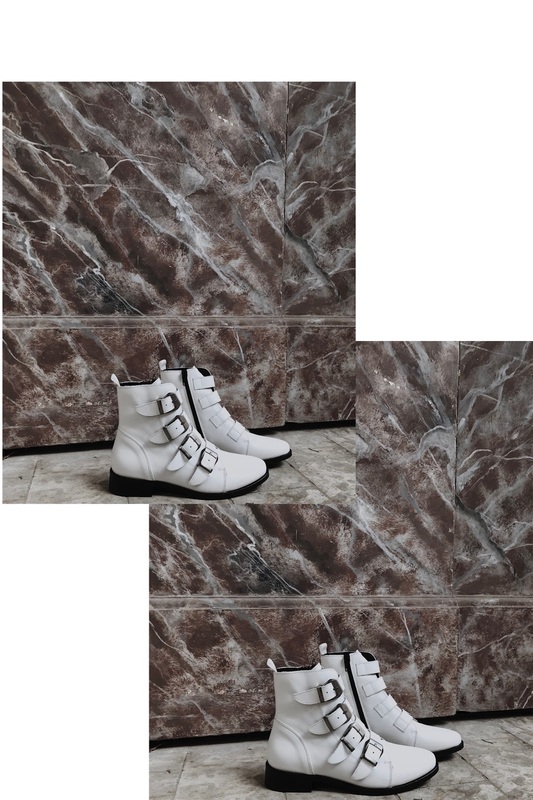 I've also been crushing on sock boots, very last minute since I feel like the 'trend' has already passed. I can't seem to ignore the fact that this is something that happens to me quite often. If the 'trend' is ongoing I don't feel interested at all. Like for example that time where wearing corsets on top of t-shirts was 'in'. It took me 2 months to like the idea of it. I think it's because in the beginning I literally see it everywhere and I just really dislike it. The less I see it the more I start to appreciate it and see the beauty of it. Kind of sounds weird but I really think this way. Does this happen to anyone else? 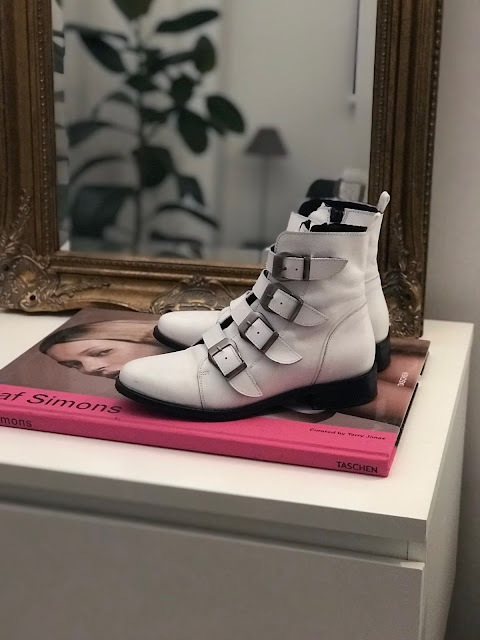 What do you think about these white boots? Are they 'too much' for you? Or the ideal eye-catcher?